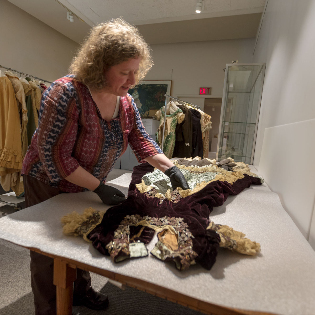 This past fall, the Institute of Museum and Library Services (IMLS) awarded the Fleming Museum of Art a grant of $86,651 to rehouse the collection of American and European garments and accessories, including a thorough condition assessment and photographic documentation. The grant will fund three crucial parts of this process: consultation with a textile conservator to assess collections needs; the purchase of new archival storage boxes; and object photography as we work towards making our collections searchable and accessible online through our new, interactive website that will debut in January 2019. Over 1,700 items have been identified for rehousing and photography, including garments and accessories from the United States and Europe dating from 1790 to 1987. Through the IMLS’s competitive grant program, Museums for America, a total of 160 projects totaling nearly $23 million were selected from over 580 applications. Institutions receiving awards are matching them with over $31 million in non-federal funds.